Dr. Andrews "Where Prices are always headed rule." Dr Andrews developed a set of rules for the application of his Andrews Pitchfork. Here is a description and several exampes of Rule No. 1. 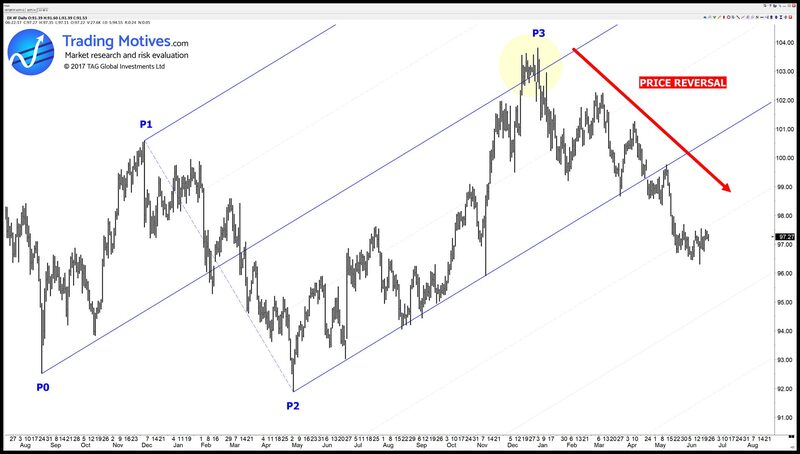 “You are amongst the very few who know that price is always headed towards the newest Median Line” (Dr. Alan Andrews). 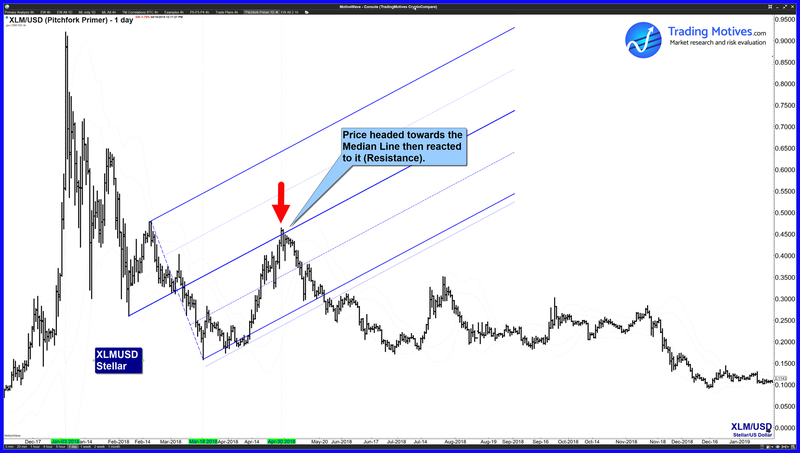 What Dr. Andrews meant by this is that there is a high probability that price will reach the current Median Line. There is some reference that price will reach the Median Line approximately 80% of the time. TradingMotives is has been building statistical research to help verify this claim, but also use sliding parallels to monitor changes in price behavior that can pre-warn when a trend is about to end and tend to rely on that method more than a statistical reference. As you can see in this daily chart of $DX_F the blue Dr Andrews Rule No. 1 worked very well. Price headed towards the Median Line, made contact with it, then reversed. B) Price penetrates the Median Line with a gap or a “zoom” (Rule No. 7 “Penetration of ML”). Those examples are covered separately. In this daily chart of Stellar ($XLMUSD) Dr Andrews rule no. 1 worked very well using the blue Median Line. Price headed towards the Median Line and made contact with it. 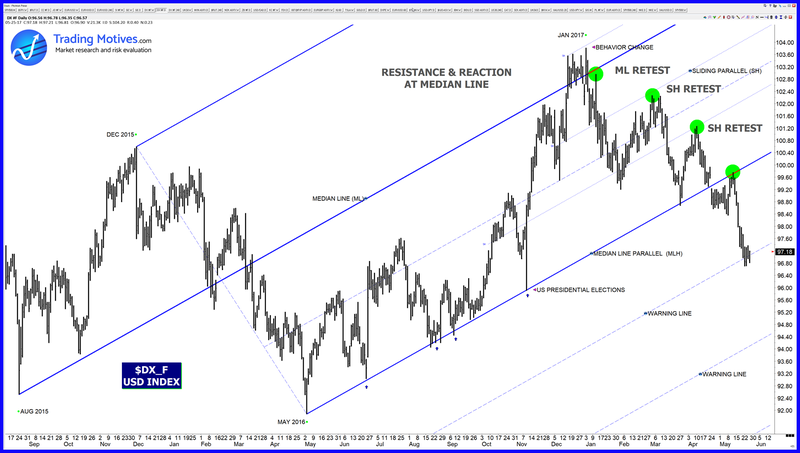 The Median Line proved to be strong resistance and price changed trend. TradingMotives refers to this situation as a change of price behavior on this time-frame. These two examples illustrate Dr. Andrews Trading Rule No. 1 very well. Dr. Andrews Rules – are there other related rules? Examples will be posted separately. If you are not familiar with Median Lines, these education modules have been designed to provide some basic knowledge and terminology used with Median Line Analytics. TradingMotives.com Market Research - covers Indices & Equities, Forex & Cryptocurrencies, Metals & Energy, Stocks.